We’re on a characterization kick this week on The Write Practice. 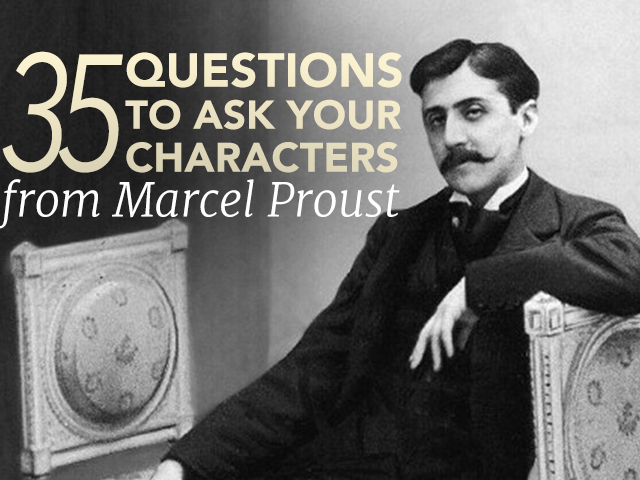 Today, we’re going to continue to delve into the lives of our characters by going through a list of thirty-five questions to ask your characters made famous by the canonical French author, Marcel Proust. This week, I’ve been working on a new story with new characters. To aid me in my quest to know my characters better, I began searching for a set of questions to ask my characters, questions that could help me get to the bottom of their identity faster. That’s when I came upon a list of questions known as Proust’s Questionnaire (or the Proust Questionnaire). In the late nineteenth century, lists of questions were a popular diversion designed to discover new things about old friends. In that way, they’re similar to the blogging “awards” that continuously circle the blogosphere. Apparently, when Marcel Proust was fourteen years old, his friend Antoinette asked him this list of questions. In 2003, the album upon which Proust wrote his answers to the questionnaire auctioned for €102,000. While these questions were originally intended for personal use, I found them to be helpful questions to ask my characters as a way to understand them more deeply. How about you? Which question is your favorite? What do you ask your characters to get to know them better? Let us know in the comments section. Ask one of your characters the thirty-five questions from Proust’s Questionnaire. Then, post his or her responses in the comments section.